I know the T-Rex is a large fierce creature and seems like it is angry all the time, but i’m sure it does have feelings, does anyone care about the fact it can not do pushups. This is a great t-shirt that features an image of a T-Rex trying it’s best to do some pushups, but the arms are just too short. Also find the text saying “T-Rex hates pushups”. 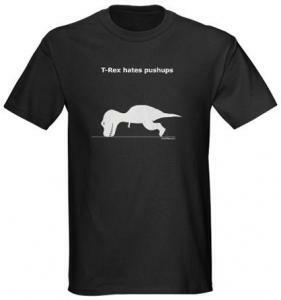 Made from 100% cotton you will be super comfortable and this could be the perfect t-shirt for when you do pushups, available in sizes Small to 3XLarge and you can get the T-Rex printed on different colors and styles of shirts.